The days feel just a bit cooler and I’m seeing apples on trees everywhere! I think this means that our September kickoff is just around the corner and piano lessons are almost back in session! In preparation for this, I have been working away in the studio and one of the projects I’m super excited about is a practice challenge for my entire student body. I wanted a challenge that would work for every student, from beginner to advanced. One that would introduce the beginners to a daily practice routine and one that would help the experienced students return to that daily practice routine. As it’s the start of the year, I also wanted something simple so as not to be overwhelming. Several years ago Teach Piano Today put out a fun apple-themed practice challenge, but though all the work was done for me, I wanted something a little less involved for our kickoff…and the chance to have a little fun with Canva and some simple graphic design was an added bonus. I’m really excited with how it turned out and if you’re a parent who would like a copy for your child at home or a teacher who would like to try it in your studio you can get it right here. In keeping with the apple theme, I dug out my old “practice tree” and placed little apple name tags all over the tree with my student’s names. Each week they complete one of the challenges, they will be able to place a sparkle apple sticker on their name. This challenge will wrap up just in time for our Thanksgiving master classes and we will celebrate completing the challenges with an apple-y treat! I can’t wait to show my students! School’s out and sun’s out! Some of you have already hit the road for summer holidays, some of you have been enjoying some exciting day camps and some of you may have just been enjoying some lazy days of summer (my son falls into this latter category!). A special few of you actually spent some of this week with me doing a summer lesson and what fun we had!! This year I decided to offer summer lessons in the form of a three lesson package OR a la carte, this week was our first installment and it was a beach theme. We enjoyed it all, from beach themed games and music to a tasty beach themed treat! For those of you who weren’t able to sign up for this week I’ll be sharing one of the games we played in case you’d like to print and use it at home over the summer to keep some concepts reviewed. It’s not too late to join the fun over the summer! Our next summer lesson will be the week of July 18th and the theme for that week will be CAMPING! There will be one more during the week of August 2nd and that theme will be ROADTRIP. Email if you are interested in some piano lesson fun for your student and a little help and review/practice motivation over the summer. No matter where you are or what you are doing, I hope music is a part of it! Over the past several weeks on our Facebook page I have been sharing some resources and tips to help keep up that practicing over the summer. Practicing the piano is a little bit like climbing a ladder, every time you practice you go up a rung, but when you don’t practice you end up going down a rung and long extended periods of practice can mean going down several rungs before lessons resume in the fall. Even the use of some great music apps can help the slip and slide! I can’t possibly share them all so if you like to keep up to date, like the Facebook page! Enjoy and have a wonderful summer!! Multi-player (Mrs. Miller’s version): Place game markers on the start circle and roll a dice to see who goes first. Draw a card and complete the task on the card. If completed correctly, move forward the number of spaces on the card. If incorrect, turn goes to next player. If you draw a beach gear card, keep it and draw another card. If you land on an oops return to the beginning! If you land on a shopping spring you can “shop” from another player. If you make it to the end with the most beach gear, you win! All last week on the Facebook book, I shared 5 tips courtesy of Teach Piano Today on how to create a special place for your child to practice….so they will want to practice over the summer! If you missed the posts, or do not use Facebook, here they all are together for you! Thank you so much to Andrea Dow of Teach Piano Today for compiling these wonderful ideas! 1. When choosing a location for your piano, select a space that is lived-in, welcoming, and well-lit. Keep it close to “the action” but not in the action. Your children will gravitate to the piano more often if it is in a central place in your home. Avoid bedrooms, basements and other “put away” places. Feeling shut-off from the family while practicing will inevitably lead to a reluctance to spend time on the piano. While choosing an appropriate space, also consider the noise factor; not only from the piano, but also from your family’s day-to-day activities. Your children want to be close by, but not competing with noise from TV’s, dishwashers and washing machines. 3. Ensure your children have all required materials at hand. Help your children put together a small basket or bin of everything they may need for home practice. Pens, pencils, highlighters, and post-it notes will give your children a sense of organization that will then spill over into their practice habits. Your children will also need adequate lighting to see their music, and a comfortable bench at the correct height to practice comfortably and correctly. 4. Make the “Practice Nest” a communal space. Children of any age appreciate company while they practice. Having a chair, couch, beanbag chair or pillows nearby where family members will be inclined to sit, listen and enjoy the music immediately sets the tone for happy time on the piano. Encourage siblings to stop by and listen quietly, and allow yourself even just 10 minutes to sit and listen with undivided attention each time your children practice. 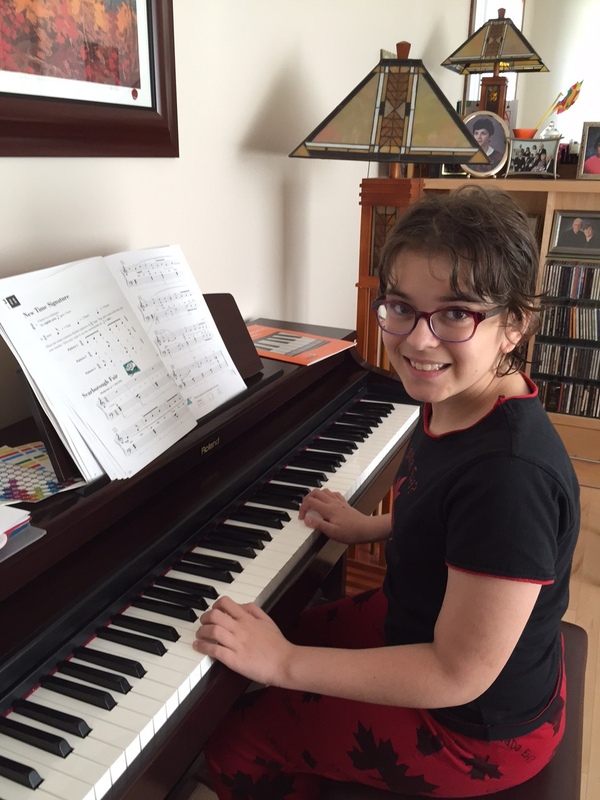 A set-up that is conducive to including the family in home practice will encourage everyone involved to make piano practice an activity the entire family can be a part of. 5. Set the stage for organization. Ensure your children’s practice space is uncluttered and organized. Clear out old sheet music and books from the piano bench, use a magazine organizer to hold current and favorite materials, and minimize knickknacks and other distractions from the top of the piano. If you can, avoid having the piano room do “double-duty” for laundry, toys and other clutter. Having the books your children need at their fingertips reliably ensures that no time is spent searching for lost or crumpled music. Get into the habit of placing the piano books in their appropriate space immediately after each piano lesson so they are ready and waiting. Aren’t those just fabulous tips!! Enjoy creating a special place for your child to enjoy their piano practice! Well, it is hard to believe that September is here already and we are soon to be back at the piano lessons and music making! Over the summer, I challenged my students to make a short practice part of their daily routine as much as possible. My one student, Elizabeth, set a goal for herself of 50 days of practice spread out through out the summer and she exceeded that goal! I am so proud of her. That is a very big achievement! 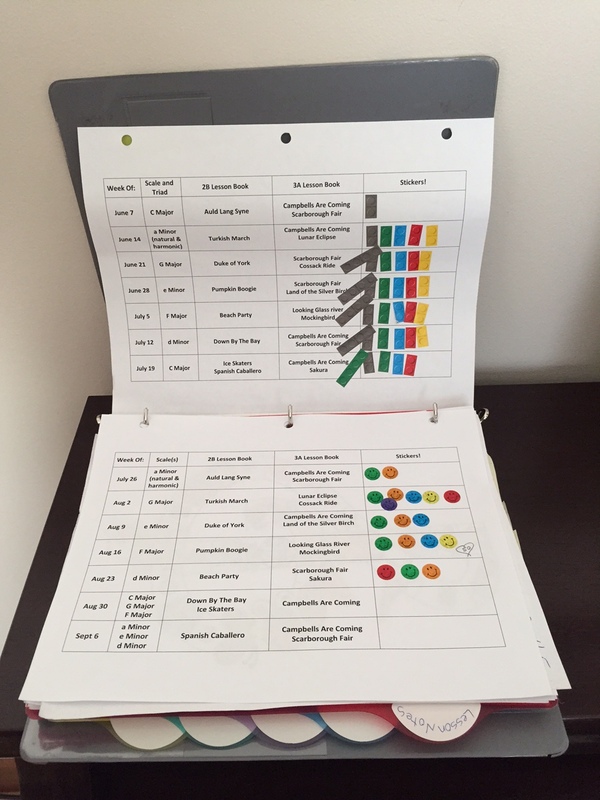 Having a goal and a plan is the key to success and in the pictures you can see that with the help of her mom, she put together a review and practice plan that helped her achieve that goal…and little sticker rewards along the way to help her track her progress! Well done, Elizabeth!!! As I write this post, we are now plummeting through August and back to school/piano lessons is just around the corner. Way back in June, I challenged my students to “practice for their breakfast” this summer to ensure they got a little practice in each day. I’m wondering…how’s it been going? Did that question just make you spit out your coffee and laugh hysterically? I can relate. It’s an age old struggle: Piano Practice. Believe or not, even I struggle with this with my own children….more so with my son than my daughter now as she has approached the wise old age of 16 and realizes she really actually loves having the ability to play the piano and it has opened so many opportunities she might never have had. My 12 year old son, on the other hand, has not come to this very wise discovery and so I soldier on nurturing the love of music in him (or as he calls it “forcing him to practice”). So, in full disclosure, it hasn’t gone quite as I had hoped this summer. There has been practice, but not as much as I would’ve liked to have seen…and not always with the most enthusiastic of attitudes. So, if you’ve been struggling this summer (and possibly this past year) with piano practice and your child has either subtly or outright accused you forcing them to do music…this video is for you. You are not alone. Hang in there. They really will thank you one day! Seeking enthusiastic, energetic and adventurous children…do you know one? Each year, I open up registration for 6 beginner piano students (ages 4-7) and parents looking for piano lessons that are creative, inspiring and fun AND 6 preschoolers (ages 2-4) who want to explore music and rhythm instruments with expression and energy while learning all about the foundations of music. If you have a child between the ages of 2 and 7, then you will find the perfect fit in one of these programs. The Sunbeams 1 beginner piano class will take place on Mondays from 4:30-5:30pm and the preschool music class will take place on Thursdays at 12:45pm. Contact mmmusicstudio@hotmail.com and join the excitement! Space is limited and classes fill quickly.